For fans of The CW’s longest running genre shows, the past few weeks have dealt their share of emotional blows. First, we learned that Arrow will be coming to an end upon the conclusion of its eighth season. And then, just last week, it was announced that Supernatural will bow out after its fifteenth. In other words, the 2019-20 broadcast year will be the end of two eras and, subsequently, two of my favorite TV series overall. Of course, this has been met with much heartbreak from viewers the world over. After all, when one invests themselves in something for so long, they become attached to the characters, actors, etc. Sometimes, folks will even cite their favorite shows as having a positive influence on their lives as a whole, saying that it got them through some tough times. Funny as that may be, I’m sure that both men – and their colleagues – will land on their feet in due time. Granted, these guys may take an extended vacation before pursuing other endeavors, but they’ll find more work. 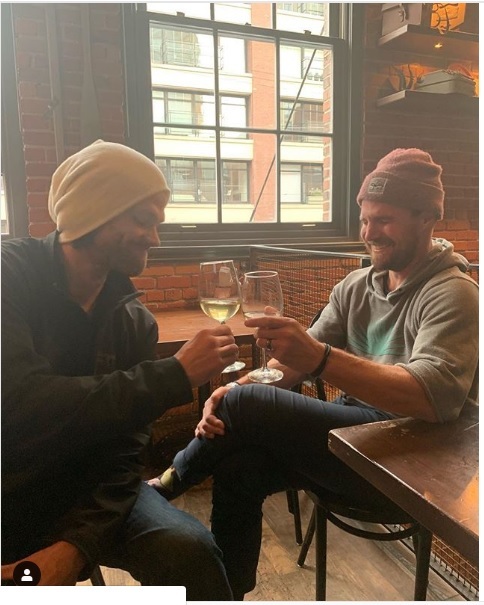 One thing in particular this photo has gotten people to discuss is that the window for a potential crossover between Arrow and Supernatural is closing. And while I don’t think those two will overlap in the purest sense, it’s possible that Amell could guest star as a character who isn’t Oliver Queen before Supernatural wraps. Don’t forget, Arrow‘s final season will consist of only 10 episodes, so he could hang out in Vancouver for just a little longer in order to spend time with the Winchesters. It’s certainly something he’s been champing at the bit to do.